It's a beautiful day in paradise. The sun is shining. The birds are chirping. And Dom Silvagni, eldest brother, indifferent student and elite middle distance runner, is turning fifteen. But instead of cake and candles, Dom receives the most unlikely gift. 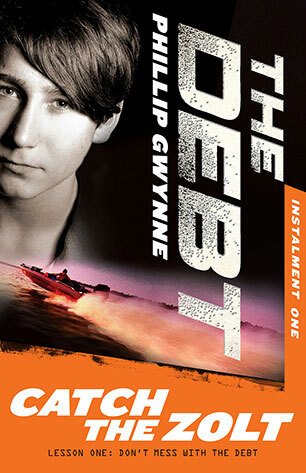 An ancient family debt from an organisation so secretive and powerful, they are only known as The Debt. And The Debt have made it clear -- Dom must perform six Herculean tasks or lose a pound of flesh. The Debt has ways of making Dom believe and before long he has his first instalment. He must catch The Zolt -- the 17-year-old Facebook Bandit who has stolen light planes, boats and cars from 'deserving' homes on nearby Reverie Island. But getting close to the Zolt means persuading his neighbour, the smug self-obsessed Tristan, to invite him to his sumptuous holiday home. And it seems Tristan has an angle too . and it involves Imogen, the only girl close to Dom's heart. Caught between a rock and a hard place, Dom has to honour his family. But the more he discovers about his father, the less he seems to know. Meanwhile The Debt wants its payment...now! Phillip Gwynne's first novel Deadly Unna? was the literary hit of 1998 winning Children's Book of the Year and selling over 200,000 copies. It was made into the feature film Australian Rules for which Phillip's screenplay won an AFI award in 2002. Since then Phillip's novels have all received both high acclaim and popularity amongst readers including his young adult novel Swerve which was shortlisted for many awards amongst them the 2010 Prime Minister's Award and the Golden Inky. Phillip's also no stranger to writing thrillers as he has written an adult detective thriller The Build Up, but The Debt is his first series for upper-primary school readers and combines both his substantial literary skills and his ability to tell a good story.